It’s tempting after moving into a house to use the garage as storage space. Not only do the usual tools, bins, exercise equipment, and bikes, but boxes of books, containers of out-of-season clothes, decorations, and whatever else you haven’t found a place for in the house can fill the garage. The best thing to do, after you’ve unpacked the rest of the house, to stay on task and organize your garage right away. But even if you run out of steam before you finish the job, you always have a chance to deal with the garage later. The key is to get it done in a long weekend or two, and follow these steps to reduce the pain of organizing the first time, and keeping it organized in the future. The first thing is that you shouldn’t try to do everything yourself. Recruit family or friends to lend a hand. They probably can’t devote the same time and attention to the entire project, but bringing in extra hands for a specific task is always a good idea. Have a friend who’s good with assembling things? Have them come over when you’re putting up shelves. Has someone in your family been looking for items that got lost in the move? Put them to work going through and categorizing stuff. First, figure out what you have in the garage in the first place. Clear out space and sort everything–first, figure out what you need to keep, what can be donated or sold, and what you can get rid of. You probably don’t need three old beaten-up Christmas wreaths in a box, and it’s one less thing to find a place for later. 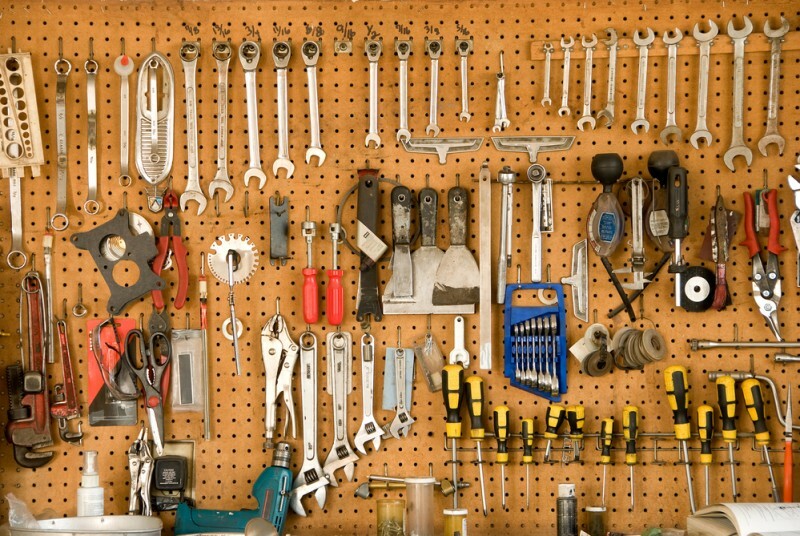 Either while you’re doing this, or right afterward, categorize what you have, such as tools, car maintenance, crafts, and so on. Get a sense of how much you’re keeping and what the needs will be for proper storage. Can things be just hung on hooks? Do they need to be in plastic pins? On shelves? You probably will have several storage needs. The idea is to have a few different options available, and be able to change things around if necessary. 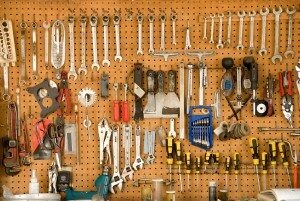 For example, if you have a lot of different tools that you’ll need to access, set up a wall of pegboard or wire grids. This lets you move around hooks or bins as needed. Another wall could be filled with shelves holding modular boxes. You can get cheap cubical shelves that work both vertically and horizontally. Also, check out your ceiling space. You can put heavy-duty hooks to get items like bicycles off the ground, or create wooden tracks to put plastic storage bins. Also, if you have old furniture like cheap plastic or prefab shelves, see if they can be repurposed–most of those are designed to stack with each other or otherwise be modular. The idea is not to spend a lot of time building your storage options. You’ll probably have to move things around later, so make sure it’s easy to assemble and reconfigure later. Even once you’ve put everything where it belongs, sooner or later things will get out of place. It’s a good idea to schedule a monthly or bimonthly chore to straighten up the garage. While you’re puttings things back, you can also figure out if your needs have changed and you get rid of something, or move some storage around. Remember, you control the garage, it doesn’t control you.